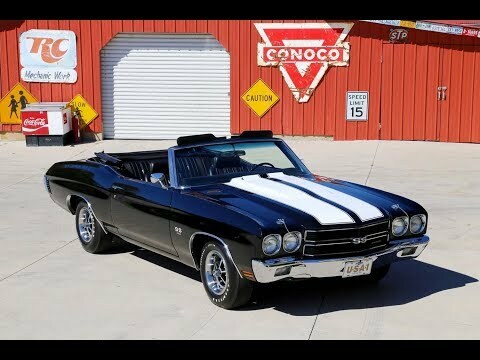 Up for sale we have a 1970 Chevy Chevelle LS5 Super Sport Convertible that comes with a Build Sheet! What you're looking at is one of the rarest examples of a Chevelle to ever hit the market. There's believed to be less than 100 LS5 convertibles ever built, and this color combination is believed to be limited to less than 5. On top of the rarity, you also have one of the nicest frame off restorations that you will ever see. The body is stunning with one of the best fit of the doors, hood, and trunk on a Chevelle that we've ever seen. All the gaps are equally impressive and all the body lines line-up near perfectly. It's covered in the Tuxedo Black Paint which is the factory color for this '70. It's accented by the White SS Stripes and the Power Convertible Top that is new and has the glass back window. The paint is base coat clear with the stripes being under the clear. It has been buffed and polished to deep rich shine that's slick as a ribbon. This Chevelle has the cowl induction hood with cold air induction flapper and factory style hood pins. Every piece of chrome and stainless appears replaced and is in like new condition. The glass is excellent condition as well and appears to have new felts and seals installed. To complete the look, the wheels are factory 14x7 SS Rallye's with F-7014 Goodyear Polyglass white letter tires. The interior is also done in the factory 756 Code, Black with Bucket seats interior. The seat covers have all been replaced and the padding is excellent as well. Also, the door panels, carpet, and seal plates were replaced. It has the factory style console with a Hurst shifter and chrome knob. Looking at the dash, it has the round gauges with working Tach, Speedo, and Clock. Also, the dash pad is like new and it has the Tilt Column with the Sport Wheel. When you look in the trunk you will see it has been detailed with splatter paint and comes with the trunk mat and spare. Under the hood looks amazing as it has been detailed to look like it would have when new. It features a 3963512 casted 454 Big Block that's set up with a '70 model GM Aluminum Intake (3963569) and a Dual Line Holley Carb. The 454 is mated to a Muncie 4 Speed Trans and a 12 Bolt Posi Rear with the sway bar. It's dressed in the factory style chrome valve covers and the stock style breather with hood seal. It also comes with the factory style smog pump and lines. This Chevelle does have Power steering and Power Brakes with Disc on the front. When you look under it you will see all the brake lines were replaced along with the gas tank and fuel lines. Also, under the front you will see it's all new from the ball joints to the end link bushings. This beautiful frame off restoration comes full circle when you see the pans have been detailed in the red-oxide primer and that the frame has been cleaned and painted black.